In Australia we have many beautiful and colourful birds that are suited to aviary life both in this country and overseas. The eighteen species of Australian grass finches almost without exception fall into this category. If we group finches using such criteria as: beauty and markings; capacity to reproduce; compatibility with other aviary inmates and ease of maintenance, then there could be no grass finch that is more ideal for aviculture than the Painted Finch. 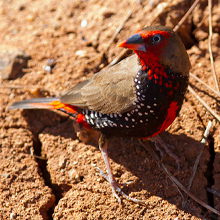 The Painted Finch is generally referred to in Australia by its scientific name of Emblema picta. Current scientific opinion places the Painted Finch E. picta, the Beautiful Firetail E. Bella, the Red-eared Firetail E. occulata, and the Diamond Firetail E. guttata together into the genus Emblema. This finch has been adequately described in the literature so I would like to only highlight some aspects of its colouration. The red rump is absolutely magnificent when seen in sunshine; it has been likened to the red tails lights of a motor car. The extent of red down the breast of the female varies considerably from a moderate amount, to none at all. Similarly, the intensity and extent of red colouration in the male varies from what could be described as "normal" to quite vivid scarlet, extending over a wide area of the underparts. Both the size and number of spots on the breast may also vary in both male and female. In my opinion there is variation in the size of the birds. My observations suggest that both in aviary bred birds and trapped birds that I have seen at dealers there are two distinct body sizes. "Normal" birds can be distinguished from a group that are generally smaller and it is these smaller birds which display variations in size and number of white spots. These differences have been noted in my own birds, in birds I have bred, and also in other collections. I have not found any reference to this size variation in literature; Immelmann simply states its length to be 4 1/4 to 4 1/2 inches. Despite the fact that the Painted Finch has been an aviary favourite in this country for many years there has, to my knowledge, been very little data recorded in the literature. Recently I went back through some thirty years of "Australian Aviculture", the official journal of the A.S.A. and was surprised to find very few articles about this delightful bird. However, Klaus Immelmann in his book "Australian Finches" gives a tremendous amount of information on this species. My experience suggests that the Painted Finch will live happily in a variety of aviary designs; it adapts well to the structure in which it is housed. The size of the aviary does not seem to be of consequence and they will breed in relatively small aviaries, but like most Australian finches they are seen to advantage in a large planted aviary. I would imagine that most people breed this species one pair to an aviary, quite often in a mixed collection, but it should be possible to colony breed this bird. However, a South Australian breeder recommends housing this species as single pairs, one to each aviary. He breeds many Emblemas each year in aviaries two feet wide. He has observed that in a colony situation, when a male displays to a female on a perch, all the other males will fly to the perch and interfere, resulting in a fertility rate of less than fifty percent. By keeping Emblemas one pair to a small aviary with no other occupants their fertility rate is often 100% and nests of four, five or six youngsters are common. However, a very experienced Melbourne breeder I consulted said that he bred as many in a colony as he bred from separate pairs. The main point to note is that the Emblema is a free breeder and, with the exception of the Zebra Finch, would be as prolific as any Australian grass finch. It should also be noted that wild caught birds have been reported to be nervous when first liberated into an aviary, having a habit of knocking their heads on the roof of the aviary. My observations confirm this, so care should be taken when liberating these birds into a strange aviary*. The Painted Finch builds a nest which is most unusual. They first construct a platform before proceeding with the nest proper. In the wild they use bark, small stones, twigs and clods of earth to construct the platform which serves as a protective base to the nest. The Emblema usually builds in spinifex grass which is the predominant vegetation in the parts of central Australia frequented by this species. After rains spinifex grows rapidly and the platform keeps out light preventing the sharp spinifex from growing up into the nest and damaging the eggs. To stimulate their interest in breeding I provide leaves, small pieces of foam rubber, and bits of cardboard which, together with small pieces of cow dung extracted from the compost heap in the aviary, enable them to build a suitable platform base for their nest. The nest as a rule is not well constructed and in an aviary the usual dry and green grasses, feathers, and pieces of wool are used to build a globular nest with a wide opening. When the young appear from the nest they are very drab replicas of their parents without any red markings on the head, beak or underparts. They have a habit of squatting on the ground in a little group and care has to be taken not to step on them when entering or walking around the aviary. Like all other Australian grass finches they take the normal seeds: white millet, Japanese millet and Hungarian millet. My birds also have access to plain sunflower seed and occasionally niger seed. In addition it is important to make available iodised mineral salts, cuttlefish, fine shellgrit and charcoal is certainly appreciated. I find that mine are very partial to plain orange cake and green food having a strong preference for chickweed. They are also fond of fossicking around in sea sand. The Painted Finch has ideal temperament, is hardy, a good mixer and free breeder once established, is easy to maintain, is of a medium price and is regularly available. As such the painted finch is an ideal aviary bird highly suited to a mixed collection. REFERENCE: Immelmann, K. Australian Finches in Bush and Aviary. Angus & Robertson. Sydney (1965). All native birds are protected in NSW under the National Parks and Wildlife Act 1974. As illegal killing and trapping has contributed to the decline of many native Australian bird species, the Office of Environment and Heritage (OEH) manages licensing systems to regulate the keeping, buying and selling of these birds by bird keepers and pet shops.